Double Dragon. The name itself evokes the game's best feature: two player, simultaneous, cooperative play. 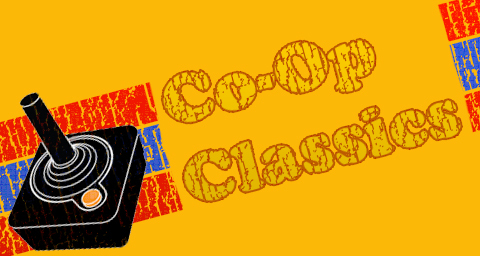 Back in 1987, when it hit arcades, there were very few games that featured co-op out there. If you take a look at our database of classic co-op games, sorted by release date, there are only a handful of titles on the list earlier than Double Dragon. The game had a tremendous effect, almost singlehandedly making the co-op brawler one of the most popular types of video game. 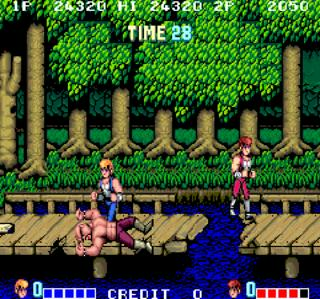 Double Dragon is to brawlers what Die Hard is to action movies. Both provide a frame of reference for other entries in their genre. The movie Speed, for example, is Die Hard on a bus. Some of the greatest co-op games ever pattern themselves after Double Dragon just like this. The Dungeons and Dragons games are Double Dragon in a fantasy setting. River City Ransom is Double Dragon with stats. And a whole slew of games are simply Double Dragon meets a franchise: TMNT, X-Men, Captain America and the Avengers, Aliens Vs. Predator, and the list could go on and on. 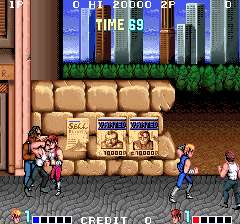 Double Dragon quite simply was the gold standard by which all following games would by judged. The story is as simple and common as they come. Billy's girlfriend is kidnapped by the Black Warriors, a gang. Billy and his brother, Jimmy, set off to rescue her. Of course, along the way, they are met by dozens of Black Warriors. The game is comprised of just four levels, with special boss enemies scattered throughout. The game only has three buttons, jump, kick, and punch. Brilliantly, different combinations of button presses and joystick motions allow for different moves. Very few games got so much action from so few inputs. Some of these special moves, like flying kicks and elbow punches, are very effective and can really knock the bad guys out. But why stop there, when you can fight street style and use an enemy's weapon against them? Whips, baseball bats, and chains all make short work of the Black Warriors. There's even environmental interaction, like kicking barrels into the bad guys. Many of these gameplay elements became the standard features of the genre. Unsuprisingly, Double Dragon was a huge hit. The game was adapted for pretty much every home game console available at the time. The NES version totally missed the boat, and left out the two player action that made the game so compelling. Really, who wants to play Single Dragon? That has to be one of the worst ports of any game ever. Double Dragon had more than half a dozen sequels, including a rather nifty crossover with Battletoads (which just might be the next Co-Op Classic; stay tuned, reader). Back in the heyday of its popularity, there was a cartoon and even a live action movie. Most recently, Double Dragon showed up on Xbox Live Arcade (though it's sadly unavailable now) and, if you aren't feeling the co-op love, you can download the NES version on the Wii's Virtual Console. There's certainly much more that could be said about Double Dragon. If it sounds like I am gushing, well, I probably am. 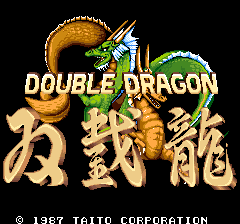 I'm almost ashamed to have not featured Double Dragon in this column sooner. The only defense I can muster is that the original is really overshadowed by its successors. Often, once a game breaks new ground, others come along and fine tune the formula to perfection. Compare the original Space Invaders to Galaga, for example. I'd personally say several other games already mentioned are "better", but still, Double Dragon is excellent. Perhaps later this summer, when you are playing Turtles in Time: Reshelled, or revisiting an old favorite brawler, you'll consider for just a moment the huge debt that these games and dozens of others owe to Double Dragon. Page created in 1.0811 seconds.